This is a handy reference tool for geography studies. An amazing amount of information in one fold-out sheet of paper: Earth's Top Ten; Solar System; area, flags, population, and government of all countries; continents' information; time zones; and a detailed, colored map (25"x16") of the world. Easy to use and handle! 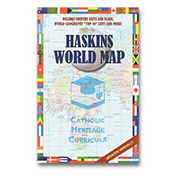 Recommended in CHC Lesson Plans for Third Grade to complete the "Tour a Country" course.